mass and moment of inertia is automatically set, according to the geometry. Note: this inherits the ChBodyAuxRef, that allow to have the barycenter (COG) and the body reference (REF) in two different positions. So the REF will remain unchanged, while the COG reference is moved to the computed barycenter of convex hull and its rotation is automatically aligned to the main inertia axes of the tensor of inertia. 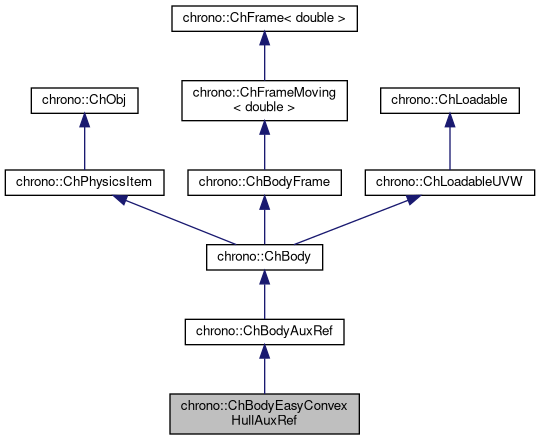 Creates a ChBody plus adds an optional visualization shape and, optionally, a collision shape. Mass and inertia are set automatically depending on density. Convex hull is defined with a set of points. collide enable the collision detection? visual_asset attach a visual asset to the body?